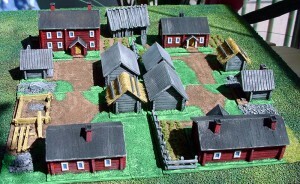 These bigger bases are used to line out a build-up area on the gaming table, so they may, depending on the scale, represent more buildings than there are models on that base. Here we have four yard-bases. 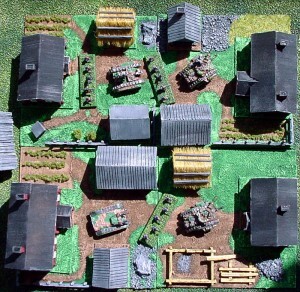 Each base has a slot for a house, large utility building and a small utility building. 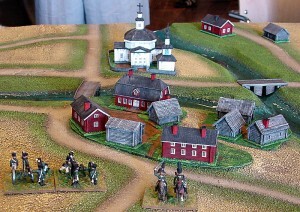 This makes the buildings interchangeable between bases. My base making method is to take a card, line out the building places and roads, then glue fine sand to the roads and rougher sand to the grass areas. Leave building areas without sand. Finalize it with a wash of thinned glue. This makes the base strong enough to have it bend back into shape if it warps for some reason. 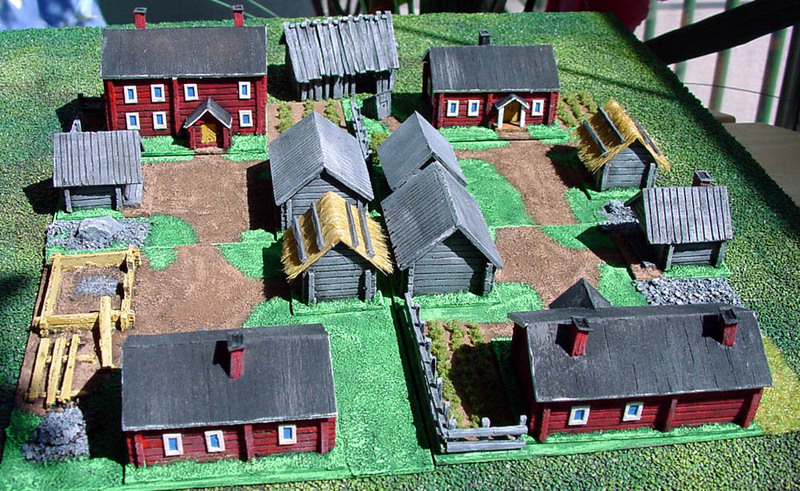 Above and below are two examples of irregular shaped areas, made to fit an exact spot on a specific game table. The from above picture shows what details can be added to the bases; gardens, bushes, rocks, fences, buildings under construction, etc. I recommend that these extra touches should be kept low as it helps with storage and prevents damage. Buildings and bases in action with 15mm Napoleonics.